This IBM Redbooks publication helps you plan and implement wireless solutions to access backend resources such as databases, application servers, and other legacy applications from wireless devices. 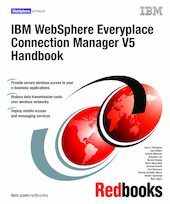 This book deals with IBM WebSphere Everyplace Connection Manager provided functions to enable businesses to make a smooth transition to the wireless Web. The information provided in this book targets Business-to-Employee (B2E) enterprise applications, but most of the scenarios presented apply to Business-to-Consumer (B2C) applications as well. In this book, you will find examples and scenarios showing ways to extend your enterprise applications to a broad range of mobile devices such as WAP phones, PDAs, and laptops using wireless and dial-up connections. Enterprise applications that can be accessed include WebSphere Application Server applications, portal applications, WebSphere Everyplace Access, MQ Everyplace, Relational Database Synchronization, and others. In this book you will also find sample scenarios showing ways to install and administrate Connection Manager using the Gatekeeper tool to configure support for WAP devices, HTTP services, mobility clients, messaging, clustering, roaming, and the available security features such as authentication, data encryption, and digital certificates. A basic knowledge of wireless and Web technologies is assumed.